Inns are a common way in role-playing games to regenerate the player, and take some money from him – in ORK Framework, this can be done using the Event System. In this tutorial, we will also create a simple Information HUD to display the amount of money the player currently owns, displaying the HUD will be bound to a game variable condition. 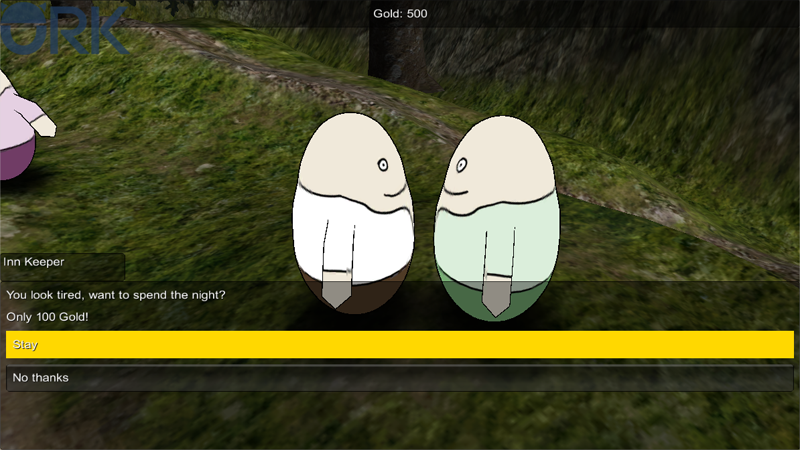 First, we’ll set up the new HUD to display the player’s current amount of money. Open the ORK Framework editor and navigate to Menus > HUDs. Create a new HUD and change the following settings. Displaying the HUD will be handled through a Variable Condition – we don’t need to rely on a specific Game State, so we can set them all to Ignore. In Control, Shop, In Event, Changing Scene, Game Paused, In Battle, Blocking Menu Screen, etc. Click on Add Game Variable to add a variable condition. We want to check a single variable in this condition – this setting would also allow us to check a template or multiple conditions. Click on Add Information Element to add a HUD element that will display our information. This will display the name (#currency.name0#) and current amount (#currency.inventory0#) of currency with ID/index 0. And that’s it for the HUD – click on Save Settings to save the changes. Navigate to Events and click on New Game Event to create a new event. The finished event will look something like this. Click on Add Actor to add another actor. To display the Money Info HUD, we need to change the game variable (moneyHUD) we used in its variable condition. This means that a global game variable will be checked. Click on Add Game Variable to add a variable. Now, we’ll display the choice if the player wants to stay in the inn. You look tired, want to spend the night? Click on Add Choice to add the first choice. Click on Add Choice again to add another choice. To hide the HUD, we need to disable the game variable – connect this step to the dialogue’s No thanks slot (i.e. choice 1). Copy the first Change Game Variables step and change the following settings. Copy the previous Change Game Variables. We also need to hide the HUD if the other choice has been selected – connect this step to the dialogue’s Stay slot (i.e. choice 0). Now we need to check if the player has enough money to stay in the inn (i.e. 100 gold). 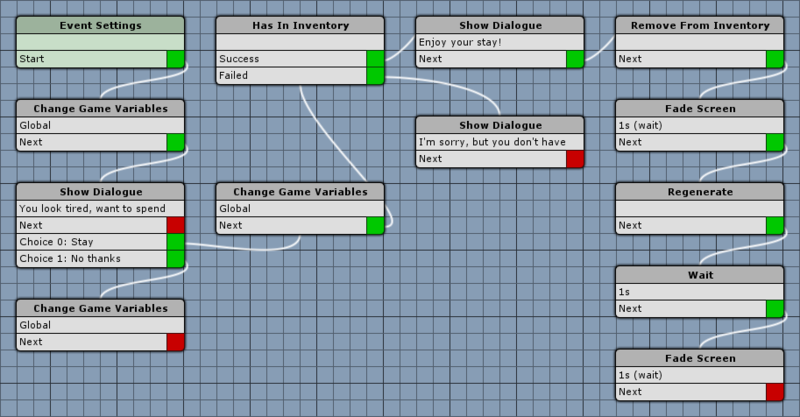 This step is connected to the previous Change Game Variables step, following the Stay choice of the dialogue. This dialogue tells the player that he doesn’t have enough money, i.e. it’s connected to the Failed slot of the Has In Inventory step. I’m sorry, but you don’t have enough. The inn keeper wishes the player a good night – i.e. it’s connected to the Success slot of the Has In Inventory step. Let’s make it dark, so that the player can sleep. Select a black color without alpha (R=0, G=0, B=0, A=0). Select a black color with full alpha (R=0, G=0, B=0, A=1). Regenerates the player group, i.e. sets Consumable type status values to their maximum value. Dead combatants in the player group will be revived. All members of the player group will be regenerated. Wait for a second for a better visual effect of the night. Copy the previous Fade Screen step and change the following settings. And that’s it for the event – click on Save Event and save it as, e.g. inn in Assets/Events/. Select the inn event asset. And that’s it – don’t forget to save your scene. If you now test your game, you’ll be able to sleep in the inn and regenerate your player. If you want to change the music during the fading/regenerating using the Change Music step, don’t forget to store the currently playing music first. This step will store the currently playing music and it’s play time position. Add this step before the fade step. Play your night music (or whatever you want to play), e.g. using Fade To. Add this step after storing the music. Don’t forget to play the stored music again, enable Play Stored Music. Add this step e.g. after the fading the screen back in.